I believe in living a simple, but rich life. I know my priorities and what’s important to me, and this in and of itself delivers richness. As I have minimized and gotten rid of stuff, I have realized just how valuable life is. I never used to look at life this way, but I am realizing now how we only live once. It’s a shame when I see people on the streets cussing and treating their children and family bad (disrespectfully). Life is not meant to be lived that way, for God, or our Higher Power put us here to connect, live, breathe, and share. Every day I am prioritizing, and the act of prioritizing never gets old to me. I enjoy it. I can’t wait to nourish them and buy nice organic soil for them and to water them every day. I am excited. 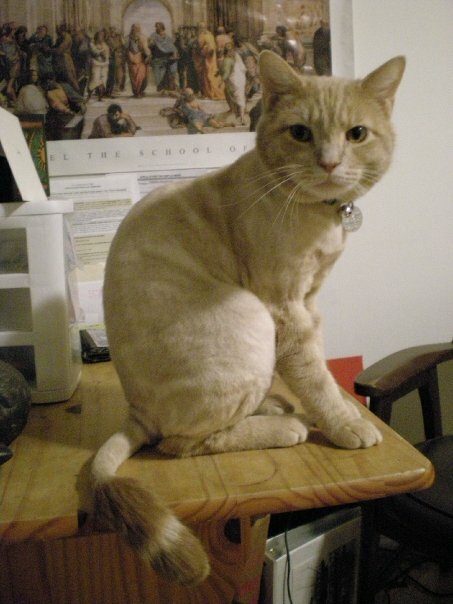 I am also excited to keep my cat groomed and even more excited to have him shaved again this summer! He loves sitting in the window, and I love watching him. I am glad that life is becoming a lot more simple for me, and I am excited to buy a bicycle soon. Every day I am checking Craigslist to see what comes up. I am really looking to buy a red, blue, or green — preferably blue (my favorite color aside from green ;)) Schwinn Varsity — women or men’s, although I would prefer to have the standard “men’s” bike with the straight-style bar across the top. The bike owner said I need a “48cm” frame and a 28″ stand-over height bar; I am pretty short! 5’4 :P Eh ;) So right now I am working on (still — a never-ending project) minimizing, sorting, and re-arranging my room. I think that I am living the life of the “Artist’s Way,” as I believe that others have gone down the same road. I am excited to eventually have my “structure” be official so that I can start maximizing my personal happiness and success. The structure will enable me to build a foundation in which to build a successful life. This entry was posted in Uncategorized and tagged beauty, Buddhism, clean, clear of clutter, de-cluttering, declutter, downsizing, family, Hindu, life, living, minimalism, minimalist, no clutter, organized, priorities, richness, simple living, simplicity, structure, style, zen. ← MMS – “Magical Mineral Solution” Day 1.